HH and the Boys: Oh-oh... A Giant BEE!!! 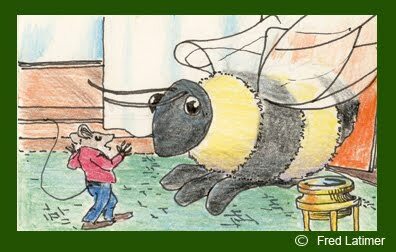 Mousey meets a giant bee... friend or foe? Oh my that is a very scary bee. Watch out mousie. haha, but he looks very happy and friendly. Zowie - that is a giant bee. Don't get stung Mousie. I think it is a friendly bee! Get some honey from your new friend! RUN little mouse RUN!! EEEEK! He looks very smiley so it be a friend. have a great and Bee utiful weekend. YIKES!! We don't think we wanna run into him! !